I am once again soliciting the assistance of the American Embassy in Madrid under art. 5 & 38 of the Convention of Consular Relations, §71.1 and §10.735–215 of CFR 22, 2715a, 71.6, 3904(1) of 22 USC, and the US government’s ‘obligation to protect’ under Gonzales vs. USA, 2011 Inter-American Commission on Human Rights) and Gonzalez Carreño vs. Spain, 2014 CEDAW-UN[i], inter alia. In Gonzalez Carreño vs. Spain, the Spanish government contended “inadmissibility” due to “judicial error” and a lack of “application for disciplinary action against implicated judicial actors” by author. CEDAW decided that the Spanish government’s defense was unfounded, further noting the lack of proof as to the effectiveness of disciplinary action by regulatory agencies in Spain. What my case, Wilcox vs. Spain, demonstrates is that regulatory agencies, and their procedures, are totally ineffective due to nepotism, negligence and corruption with government, and pseudo-government agencies. In addition to demonstrating an extensive and systematic cover-up of domestic abuse by judicial actors, my case shows to what extent regulatory agencies are becoming accessories after the fact to judicial negligence and corruption in their failure to investigate. For your records, please find enclosed a copy of my latest correspondence to Spanish authorities, noting that the failure of Spanish authorities to launch a full-scale investigations into the criminal negligence and rampant violation of my rights in judicial and extra-judicial proceedings, particularly allegations against implicated lawyers, judges, and the physic-social team of the juzgado de Mostoles, between 2007 and 2012. The continual refusal of the American Consulate and Embassy in Madrid to utilize their power and authority as provided for under the Convention of Consular Relations to fulfill their obligation to protect American citizens living abroad is in gross violation of international human rights law and jurisprudence (Gonzales vs. USA, Inter-American Commission on Human Rights, 2011). The fact that American citizens are residing (or travelling) outside of American territory and jurisdiction does not extinguish the American government’s obligation to protect. Please note that in the case at hand the American government is not impeded by the ‘state vs. federal’ arguments that they US government is using in Gonzales vs. USA. In fact, the jurisprudence by the International Court of Justice, Avena & Mexican nationals vs. USA, 2004, inter alia, clearly provides the legal authority of Consulates to be informed as to judicial and extra-judicial procedures in which their citizens are involved, as well as protest over the violation of the rights of their citizens, under Art. 5 of the Convention of Consular Relations. What is lacking here is the will and volition of governments to implement and utilize the laws at their disposition to protect victims of domestic violence, and not a lack in legislation or jurisprudence – as they contend. 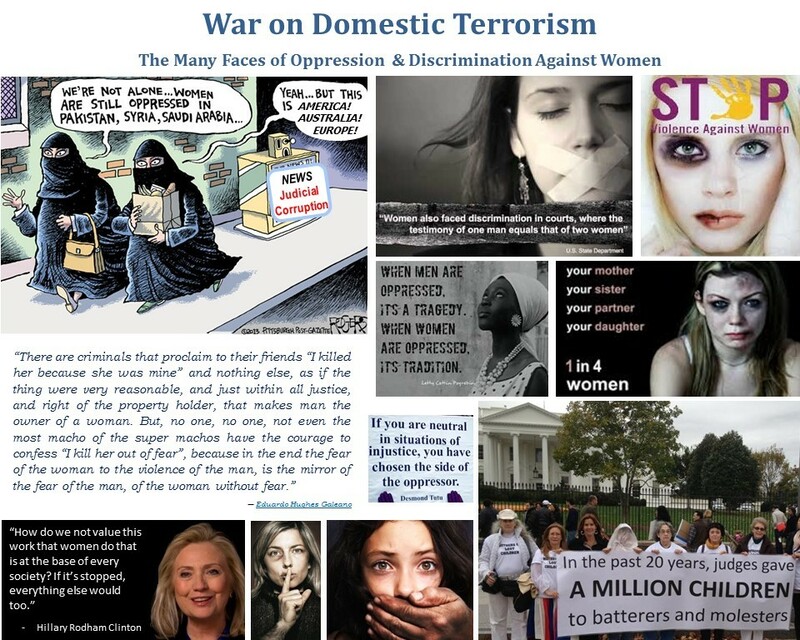 Additionally, the American government’s policy of refusing any assistance to American women and children victims of domestic abuse residing abroad, and involved in divorce and custody procedures, is flagrant discrimination by Department of State officials, and in violation of USA federal law (whereas their exist ample proof and documentation of rampant and extensive re-victimization of victims by judicial actors, their own lawyers included, see reports by Amnesty International, Save the Children, and CEDAW jurisprudence Gonzalez Carreño vs. Spain). Please find enclosed a copy of Family Courts in Crisis, (FCC) Oct. 2013, which documents the fact that almost 70% of women involved in international child abduction (by mothers), are fleeing domestic abuse and the failure of host governments to fulfill their obligation to protect them. Not only are Consulates not providing these women, and victims, with the services and assistance mandated by federal and international law, but State Department officials are then providing ample assist to their abusers in tracking down and incarcerating these mothers, whose only crime is a desire to protect their children. The fact that State Department official’s refusal to protect is guided by the same prejudices and ‘habitual custom’ as judicial actors (as demonstrated in FCC) elevates their tort, culpability, and legal liability in light of Gonzalez Carreño vs. Spain and Gonzales Lenahan vs. USA. The continual refusal of the Spanish, American, and French governments to utilize their power and authority to fulfill their obligation to protect, and their rationalization of said refusal (habitual custom) is exemplary and reflects the continuing bad faith of these governments in fulfilling their legal obligation, and official promises, to protect victims of domestic abuse and violence. As I have stated in the past, my case is no longer just about the violation of my and my children’s rights, but rather how they are representative of the “a widespread or systematic attack directed against any civilian population [women], with knowledge of the attack [by its government]” (art. 7, Rome Statutes), and government’s refusal to take positive action against the author of said attacks, refusal to take positive action in ending impunity of authors and their accessories, and refusal to take positive action in reversing discriminatory norms amongst judicial actors. In light of the aforementioned, I am once again soliciting the assistance of the American Embassy and Consulate in Madrid in assuring that the Spanish government fulfill their obligation under Spanish and international law to investigate allegation in my official complaints and communications. I have repeatedly demonstrated my good faith in this matter, and for your records I am including my latest communication to Cuatrecasas regarding the issues involved.